While housetraining, there’ll be plenty of times you can’t be around. 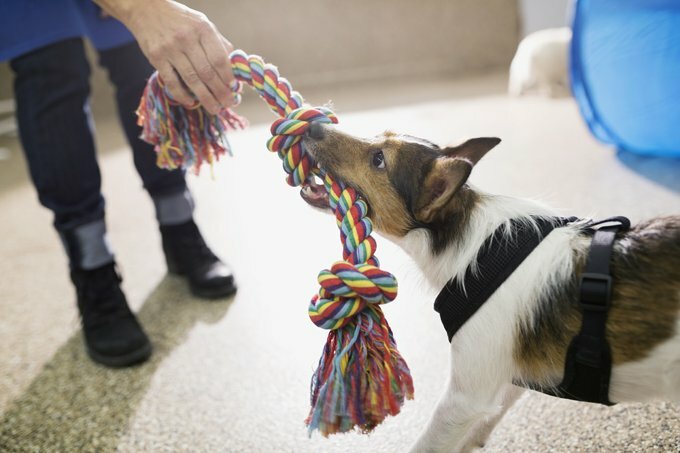 For those long stretches while you’re at work or school, your dog will need a bigger space than a crate in which she can rest, play, and potty. A crate is not a good option if you are going to be gone for several hours. 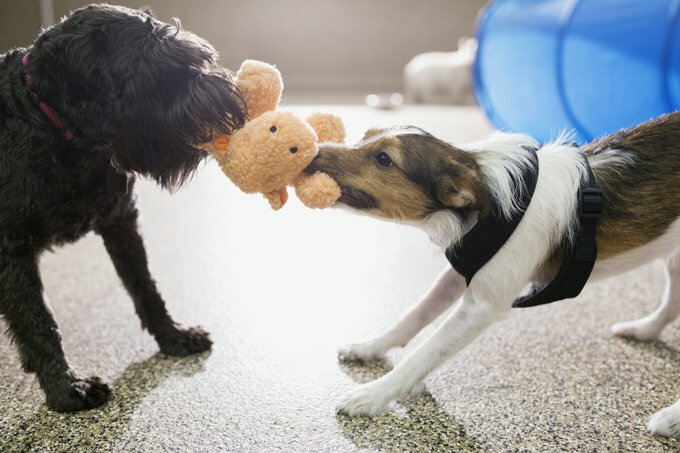 Here’s how to set up a dog playroom. Pick a corner in a family room or kitchen, preferably one with an easy-to-clean floor, and gate it off. The best room is one that isn’t isolated from the rest of the house since you’ll want your dog to continue to be exposed to household bustle. Stock it well with a crate or dog bed and at least two food-stuffed chew toys. Some people also like setting up place to potty, or indoor toilet, when they know they’ll be out for a while. Put your dog in her playroom. Gradually increase the time you keep her in the room. Practice putting her in the room by herself at least once a day for a week, or until she’s comfortable staying alone. 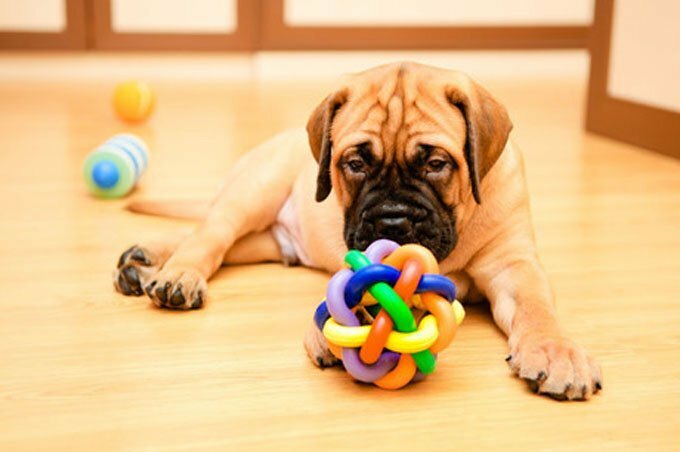 DogTime tip: Introduce the playroom when you first bring home your dog, even if you aren’t going anywhere. This will better prepare her for the first day you have to leave her alone. Be sure to give her a stuffed chew toy every time you put her in her playroom. Feed her all her meals in her playroom until she learns to settle down quietly with a chew toy after meals so she learns to associate the space with something good, and delicious. Note: Leave her bowl of food on the ground for no more than five minutes, and take it away even if she hasn’t finished. Continue to do this until she learns to eat quickly. Don’t ever let your dog out from her playroom when she’s crying and carrying on. Wait it out. Only when she pauses in her protest should you reward her with cuddles and play. Some dogs do better if their playroom is closed off from the rest of household so they’re not constantly reminded that they’re penned up. Pick an area that works best with your pup. Remember, the best place for your dog or puppy is with you. The playroom should never be a punishment or an excuse to be a lazy or not pay attention to your dog. The payroom is tool to help with potty training and get your puppy use to your occasional absence. The playroom is also a great safety tool, if you break a glass and need time to clean up, it’s a perfect safe zone for your pup. Dogs are pack animals and should not be left alone for long periods every day. If you are gone for many hours every day and nobody else is home and you can’t have more than one dog, get a cat.